There’s been no shortage of things written about the apple watch this week. The 18 caret model might cost thousands of dollars while at the same time there will be a $349 model. Apple plans all kinds of finishes and bands to appeal to a wide variety of people. Apple invited not only tech journalists but also fashion influencers to the event this past week. And yet the thing is NO ONE really knows if this will be a big deal or not. Like practically every apple device over the past 15 years it’s an unknown. As the analyst Benedict Evans says “it’s a pane of glass it can do anything”. Apple seemed to be unsure how it might be used either. They demo’d the apple watch as a fitness tracker, a music player, a watch, a key to your hotel room, a payments device, a remote notification screen, a navigation device, a digital picture frame and lots of other things. 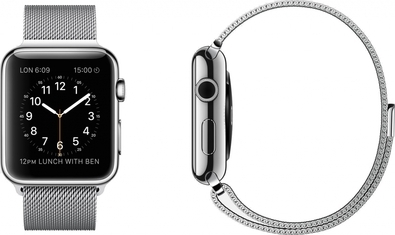 The thing I’d like to focus on though is the apple watch as a communications device. The apple watch has a “haptic feedback” feature. The watch will let one person touch the watch face to send a small “message” or gentle vibration to someone else. While to some people this might seem to be a gimmick to me it feels like something special. Many interactions are nothing but a single bit of data. How many times have you said said text me when you get there, or text me to know you landed, that you’re home safe, when you’re ready to eat, when we score, when you’re finished. In all these instances you are just looking for those same words sent back to you. You just needed a bit of info and a single “tap” would let you know what you needed to know. While this may not seem like much almost any small improvement in communication has been a success. Why would I leave a message I can just call back later, why would I send an email when I can just walk down the hall, why would I need a car phone when I can just check my messages when I get to work, why would I send a text message when I can just email, why would I tweet or Facebook when I can email and the list goes on. What might be seen as a very small improvement in communication can often turn out to be a very big deal. The haptic feedback mechanism might very well be only for family and very close friends. This seems like a pretty intimate form of communication to me. A small “touch” that lets you know your spouse is thinking of you to replace the I love you text. I little nudge to your kids to wish them luck before the big test, to let a sick family member know you hope they’re feeling better and all of the use cases above to let someone know you’re safe, home, landed or leaving. This weekend I went to the OU-Tennessee football game, my friend received a cute drawing from his son as we were walking into the stadium. I can imagine it would be pretty special to get little taps back and forth during the game as the Sooners made great plays. There’s a couple of secondary features too. One that allows for drawing on the watch face and the recipient to see. And the other to send your heartbeat to the other apple watch user. Being the fact I can’t draw a good stick man and don’t want a constant thump, thump, thump on my wrist I’m not sure these are something that will appeal to me. However, maybe there’s some kind of drawing messaging system that evolves, maybe a line moving left to right means “leaving”. I don’t know and neither does anyone else. Don’t bet against marginal increases in ease of communication. We want to feel close to those who we are separated from, we want to create connections across the miles, we want to touch and feel and connect. It’s anyone’s guess if the apple watch helps us do those things.